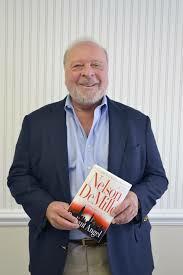 Inside Garden City is beyond excited to have Garden City resident and NY Times Bestselling Author, Nelson DeMille, as our next GC Insider of the Month! Mr. DeMille has written a plethora of books, The Gold Coast being one that has many locals fans, as it is set in our small corner of the world. Personally, Plum Island is one of my all time favorite books. Mr DeMille’s newest book, Radiant Angel, is yet another that should not be missed. But amidst his busy schedule of book tours, appearances and signings, Mr. DeMillle was gracious enough to serve as our GC Insider of the Month. Of course, we were thrilled and asked him our Garden City Qs. Mostly I’m inspired by the thousands of fan letters I receive from people who have enjoyed my books. I’m also inspired by fans who come to my booksignings and who tell me how my books have impacted on their lives. 2-Has Garden City been the inspiration for any characters or places in your books? I’ve used Garden City as the locale in my book Word of Honor, published in 1985. But I’ve never directly based any of my characters on anyone I knew in Garden City. My characters are usually composites of people I’ve known all over the country and the world. 3-How long have you lived in Garden City? I’m celebrating my 40th year here in October. I moved in 1975 into a small Tudor in the Franklin Court section. I paid $64,500 for it, and my friends and family said I overpaid. 4-What do you love most about the town? The people. I have friends I’ve made since I first moved here, and my wife and I continue to make new friends. 5-Favorite store in Garden City? I like all the small businesses along 7th Street and Franklin Avenue, especially all the food shops where I can get lunch, or dinner if I’m working late. I enjoy the convenience and friendliness of downtown shopping, and I like the personal service. 6-Favorite thing to do in Garden City? My wife and I enjoy going to events at the Garden City Hotel – charitable fundraisers, weddings, and other happy occasions. 7-Favorite outdoor place in Garden City? I have an eight-year-old son and I spend a lot of time at St. Paul’s Fields and all the other parks where he plays various sports. 8-Favorite restaurant in Garden City? We patronize all the restaurants but we mostly go to La Nonna Bella, Walk Street, Leo’s, B.K. Sweeney’s Uptown Grill, and also the Polo Lounge and Polo Steakhouse at the Garden City Hotel for special occasions. 9-Favorite place to have a drink in Garden City?Any place that has a bar. 10-What would you change about Garden City? I’d like to see fewer banks on 7th Street – there are six now. We need a hardware store again, and like most people I miss Riesterer’s Bakery. 11-Do you have any advice for Inside Garden City readers? Shop locally, eat and drink locally. Patronize everything in town, including our great library. Get involved in community and church affairs and organizations. Volunteerism has always been strong in Garden City and we all need to give something back to the community. Click here to visit Mr DeMille’s website where you can learn about his books, including Radiant Angel, plus view photos, read FAQs and more. A big Thank You to Nelson DeMille for sharing his Garden City views with us and for being our latest GC Insider of the Month! Please follow InsideGardenCity.com and like us on Facebook and Instagram.